Stylishly compact and designed for high performance, the MX-C300W offers built-in wireless LAN connectivity, making it easy to put this four-in-one colour MFP to work in a variety of settings. The MX-C300W can connect wirelessly to any notebook PC, smartphone, or tablet that has wireless LAN connectivity. 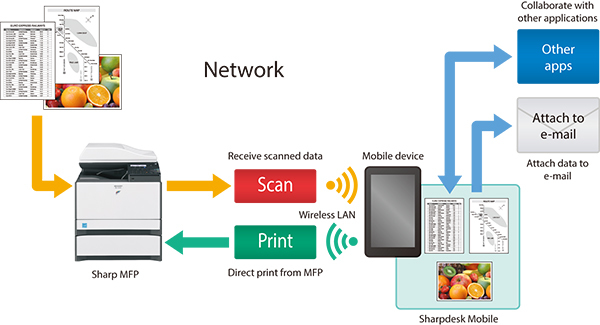 This lets users conveniently initiate MFP printing and scanning via their mobile devices from almost anywhere in the workplace and also allows flexible placement of the MFP. The MX-C300W offers ultra-handy wireless access via two easy modes: infrastructure mode and access point mode. These two modes enable the MFP to accommodate various user-environment factors, such as installation location and the type of LAN available.